Actually, I love all four seasons. I even love winter. Well, I guess it’s particulary because of the time before christmas when everybody is holiday mood. But after winter when it feels like you could only eat cabbage and keeping apples, you long for more freshness on the plate (and not to mention for some warmer temperatures). Rhubarb is one the first messengers of spring for me. And because the rhubarb which is harvested in the beginning of the season much milder and more digestible I eat it in the first week of the season whenever I can and cook plenty of jars of strawberry rhubarb compote (you can also use raspberries or just some organic grenadine juice to enhance the colour). 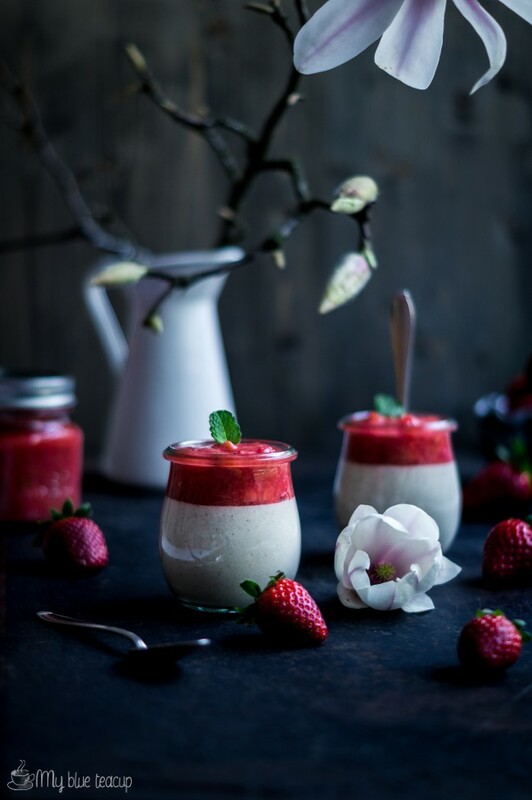 It’s one of my hubby’s favorite dessert and he loves to eat it with custard, all kind of puddings, yogurt or with some of our all time favorite dessert panna cotta (“cooked cream”). If you also love this italian classic dessert and the slight sourness of yogurt, give this version a try (I love to replace heavy cream with yogurt anyway ;-)). Cut the vanilla lengthwise and scrape out the pup. Mix vanilla pulp, sugar, agar-agar and heavy cream in a saucepan and bring briefly to a boil. Remove pan from heat and stir in the yogurt in two stages. Divide mixture among 4-6 jars and let cool down to room temperature. Then chill for at least 2 hours. 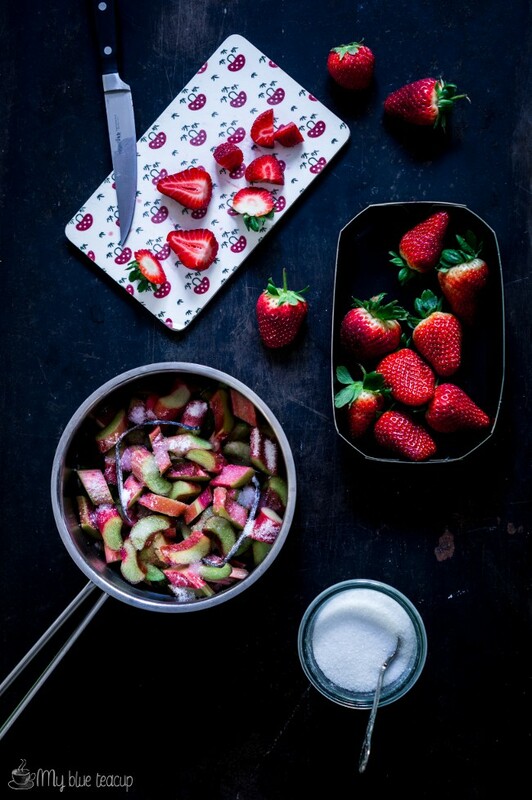 In a pot stir together rhubarb, the scraped out vanilla bean and sugar and let stand for at least 1 hour. Add strawberries and bring over medium heat to a boil and let simmer for 5-10 minutes and stir occasionally. Mix corn starch and 2 tbsp. water and stir gently in. Let simmer for 2-3 minutes until any starchy taste has been cooked away. 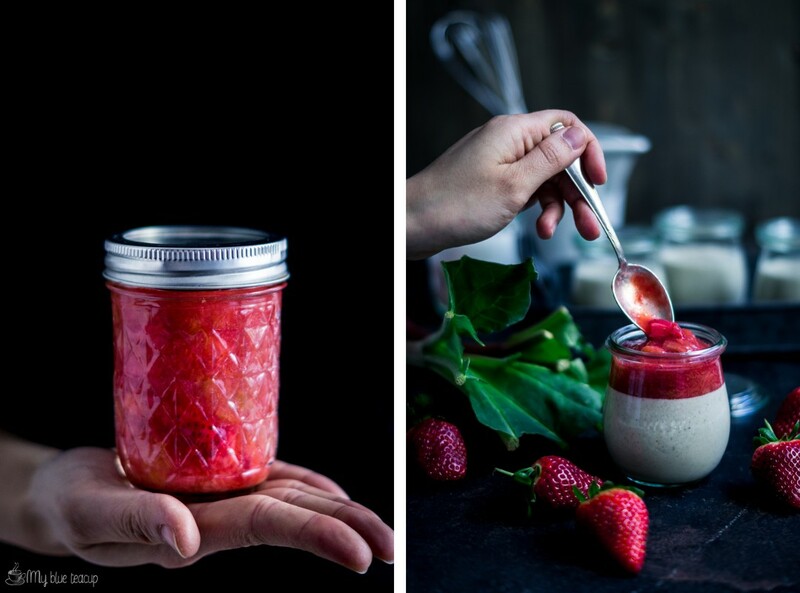 Remove vanilla bean and transfer the compote into clean jars and let cool down. Serve panna cotta with compote.